Disclaimer: I am not responsible for any bricked devices, dead SD Cards or anything else that might happen as a result of flashing firmwares you modified with this tools. Furthermore your warranty will be voided if you flash modified firmware! 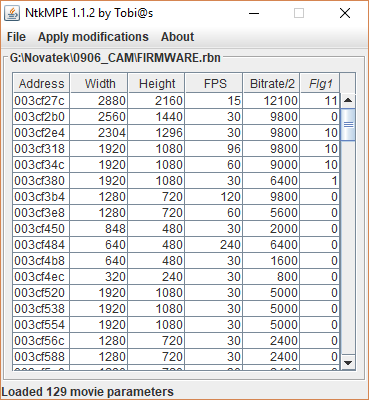 About this tool: It allows you to modify movie parameters like width, height, fps and bitrate for different modes without using a hex editor.